PHM 3034. 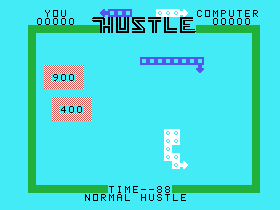 .. .. .. .
TOUCAN'S TRIVIA: This game is a port of the 1977 Taito/Gremlin Arcade game Hustle, making it one of the earliest Taito arcades brought to the home. Unlike Milton Bradley's "Blasto" port where they changed the battle vehicles to tanks (in the arcade original they were some type of space vehicles), all the game elements here stay the same compared to the arcade. TOUCAN'S TRIVIA: This game would be the second programming job done by Robert S. Harris (AKA RoSHa) before going on to create games for the Odyssey2, his most famous title being the well-known Killer Bees! 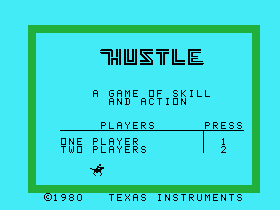 His first programming job was Blasto (Milton Bradley/Sega) also on the TI. TOUCAN'S TRIVIA: According to Bob Harris this game was first started by Elaine Henshon, but for unknown reasons she sopped working on it. Bob speculates that the reason for this was because Elaine was busy working on 3 other TI-99/4A titles at the time for Milton Bradley, and could not meet the upcoming deadline for the project if she was working on 4 titles all at once. 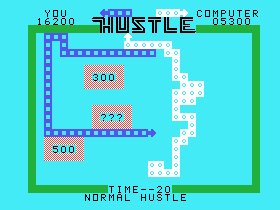 Bob also provided this interesting tidbit on Hustle, "About the only other inside info I can think of is that I had a lot of interesting play variations in Hustle which were removed before it went to market. Mostly higher speed settings and different snake lengths. I used to play the game a lot at lunch with Noah Falstein. One enjoyable version was super high speed with snakes that stayed at length 2 (two squares). You won if you crashed into the other snake's tail. It was basically a dog fight...not evey idea I had was a good one. I also thought it would be a good idea if the playfield was bright fry-your-eyes magenta."